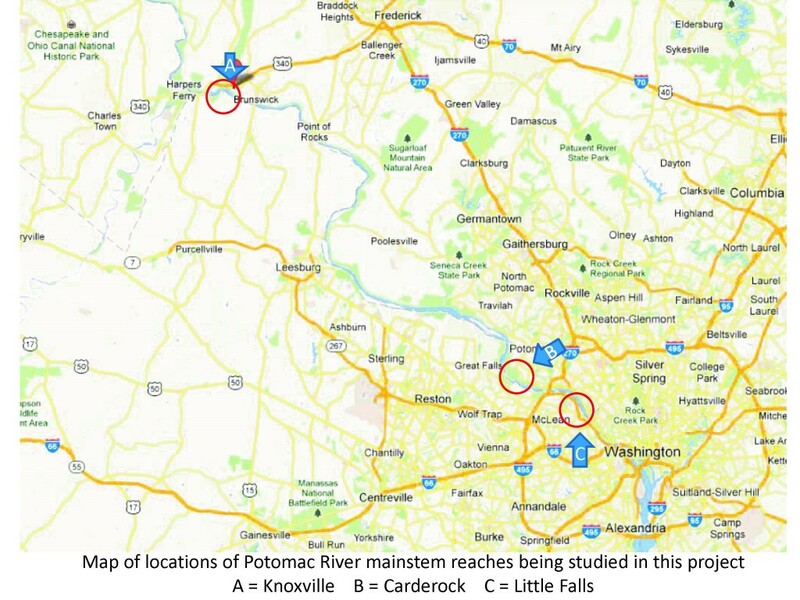 This project documents the status of three key biological communities in critical sections of the Potomac River mainstem. It helps to determine if the mainstem is meeting water quality goals and Clean Water Act objectives, and it increases our ability to assess the potential impacts of water withdrawals and flow modifications in the Great Falls and Little Falls sections of the river during droughts. The project augments state-wide monitoring programs in Maryland and Virginia. Monitoring, which began in 2012, takes place at three mainstem sites: 1) near Knoxville, Maryland; 2) Great Falls, near Difficult Run; and 3) Little Falls, downstream of the Brookmont Dam. Benthic macroinvertebrates, submerged aquatic vegetation (SAV), and freshwater mussels are surveyed once each summer between June and September. A comprehensive final report on results from 2012-2014 is being completed. Contact us for information on subsequent years.